Mount Gibson Iron ((MGX)) is a producer of iron ore products. The Company's principal activities include mining and shipment of hematite iron ore at Koolan Island in the Kimberley region of Western Australia, mining of hematite iron ore deposits at the Extension Hill mine site in the Mid-West region of Western Australia and haulage of the ore through road and rail for sale from the Geraldton Port, and exploration and development of hematite iron ore deposits at Koolan Island and in the Mid-West region of Western Australia. The Company operates through two sections, being Extension Hill and Koolan Island. For the year ending the 30th of June 2018 revenues increased 37% to A$266.3M. Net income before extraordinary items increased from A$25.6M to A$99.1M. Revenues highlight the Extension Hill section increase of 39% to A$254.1M. Broker consensus is “hold”. The dividend yield is 5.1%. → Broken through the channel and resistance. → Recent results ahead of consensus. → FY19 could be a transition year as mining in the mid-West ceases and Koolan Island restarts. → Koolan island has high-grade product which is expected to yield significant premiums and transform earnings. → An increase in reserves just mentioned, increasing mine life by around 40%. → Broken up through a line of resistance which should now be acting as support. A couple of days ago we reviewed Fortescue Metals ((FMG)), where the larger degree patterns were continuing to look promising. Iron ore is at a critical point. Suffice to say, the patterns still need to prove themselves, especially as price is continuing to consolidate. MGX is also heavily aligned to iron ore and could even be deemed more of a one trick pony as it has little in the way of diversification. That said, we can’t argue with price action on this chart which continues to look bullish. During our last review price was posturing around the upper boundary of the zone of support, with the ideal situation being that buyers stepped up. This has transpired resulting in an impulsive leg higher over the past three weeks or so. There is no high probability wave count on the chart although on the weekly timeframe (not shown) price has broken higher out of a large ascending triangle that commenced in early 2017 which can only be viewed in a positive light. What we are left with on this daily chart is a break up through resistance, a retest of new support followed by a clean trend higher which is about as good as it gets. There’s still no doubt that the company is a recovery play, albeit one with plenty of upside potential, even in regard to seeing a larger bounce only. 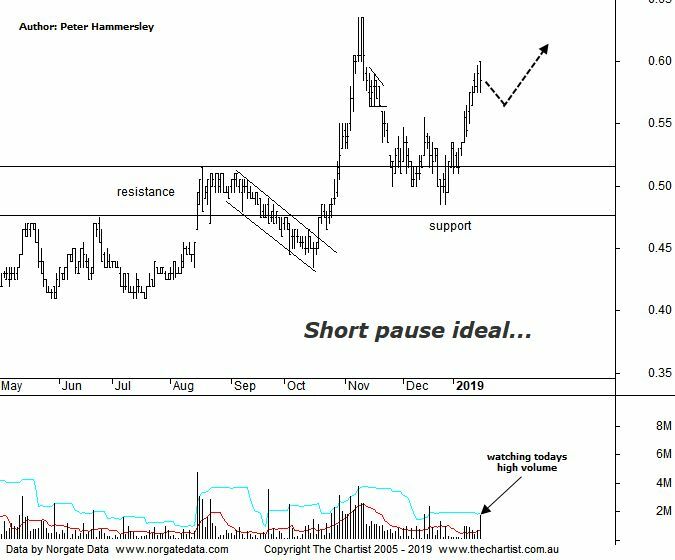 The bullish case will remain unless price heads back down through the lower boundary of the zone of support around $0.47 although unless iron ore starts to show weakness this looks highly unlikely. There’s no low-risk entry available at the moment although a small a-b-c correction down or even a micro consolidation pattern will gain our interest regarding a long trade. As mentioned above, the patterns in Fortescue Metals are looking promising although we’d like price to come back down over the coming days to fill a small gap that has been left, especially as it coincides with a zone of support. Should this transpire I’ll be making a formal recommendation without doing another formal review.